Good athletes often excel in more than one sport. Harry led a Lewistown, Ill. high school basketball team to a berth in the Sweet Sixteen Tournament at old Huff Gymnasium in Champaign. During the war, he played baseball for the Pensacola Naval Air Station in Florida, and the Iowa Seahawks Navy basketball team before heading for Bradley. Playing for three Bradley University basketball teams, he was renowned for his speed on fast breaks and was a prolific scorer at guard, often in double figures, as A.J. Robertson built his post-war teams. Also playing baseball, he was an outstanding hitter and a slick fielding shortstop. He extended his baseball career with the Peoria Sunday Morning League both as a player and coach with Letourneau Westinghouse teams. In 1960, after several years as a high school official, Harry ventured into a new field and became a Missouri Valley Association Basketball official. Five years later, he was honored by being one of only three officials to be given the "Plus-courage" award by the MVA. 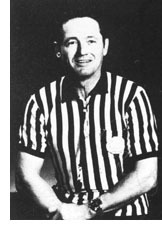 He was picked to officiate the Illinois-Indiana All-Star game in 1968, the Illinois High School Athletic Association Tournament in 1969, the NCCA Small College finals in 1970, the NCAA Quarter Finals in 1971-72, and the Aloha (Hawaiian) Collegiate All-Star Games in 1972. He is a member of the Bradley University Athletic Hall of Fame, and was named to the Illinois Basketball Coaches Hall of Fame in 1981. After many years as a lobbyist for the Illinois Sheetmetal Workers, Harry is now retired, residing in Chatham, IL.